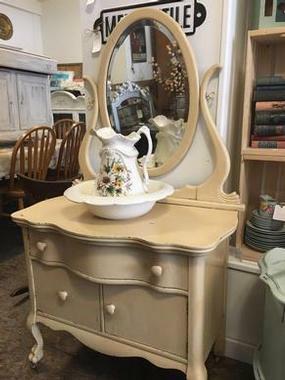 A warm country farmhouse yellow - this antique washstand is just too cute. Not sure if the swing mirror is original but it adds such charm. Measures just 34” wide x 21” deep at front curve x 27.5” high. Only 57” high to top of mirror. Did we mention it has claw feet and original wheels? Priced to go at $210. At The Gypsy Traders - 238 Manitoba Ave in Selkirk. Open Wed thru Sat.